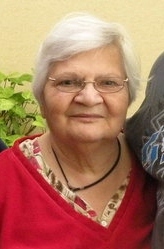 Maria S. Gonzales, 76, passed away April 7, 2011 at Sanford Health Systems in Sioux Falls surrounded by her family. She was born on November 1, 1934 in Puerto Rico and was raised by Raymond and Teresa Marrero. At the age of 8, she moved to California where she started her family. In 1987, she relocated with family to Sioux Falls where she began working as a Food Court Attendant at the Empire Mall until her retirement in 1997. Maria enjoyed collecting porcelain dolls and angels, going to the movies with her grandchildren, going for walks, going out to eat, and having coffee with family and friends. Grateful for having shared her live are her five children: Alex Gonzales of Fremont, California, Isabel Hernandez of Sioux Falls, Kathy Gonzales of Yankton, Maggie (Jose) Sanchez of Fresno, California, Tony Gonzales of California; 17 grandchildren: Monica Evans, Theresa Gonzales, Matthew Gonzales, Isabella Gonzales, Robert (Lisa) Gonzales, Julio Hernandez, Leticia (Casey) Bautista, Fabian Hernandez, James (Nicole) Hernandez, Margarita Hernandez, Michelle (Ronaldo) Rivera, Christina Andersen, Juan Cardenas Jr., Jose Sanchez Jr., Sonia Sanchez, Christina Sanchez, Desiree Sanchez and 13 great-grandchildren: DeAthony Hill, Jalen Hill, Madison Andrews, Jordyn Gonzales, Selena Gonzales, Cedric Mills, Riley Davis, Daniel Rivera, Ricky Rivera, Jonathon Rivera, Aaron Rivera, Stephanie Meeter, Sean Andersen, Angel Sanchez. She is also survived by her sister, Grace Maldonaro of Vallejo California. She was preceeded in death by her parents; her sister, Carmen Pacheco; and grandson, Marcus Sanchez. Visitation will begin at 5:00pm on Monday, April 11 with family present from 6:00pm â€“ 8:00pm at Barnett-Lewis Funeral Home. Funeral Service will begin at 11:00am on Tuesday, April 12 at Barnett-Lewis Funeral Home.